Furniture Flippin': Don't Cha Wish Your Bathroom Was Hot Like This? Don't Cha Wish Your Bathroom Was Hot Like This? 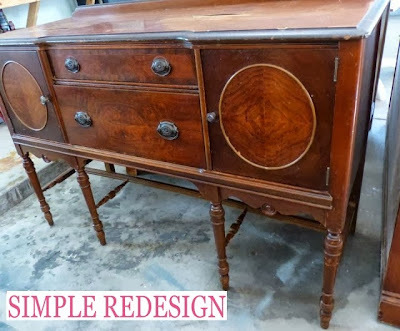 When Julie from Simple Redesign submitted her furniture flip to me she had no idea the torture she was unleashing on me. I went through a myriad of emotions. Anticipation - while I clicked the paper clip icon to see the picture. Astonishment - at the gorgeous after picture. Excitement and joy - that it was such a cool use for an old object. Disappointment - that Triple H wouldn't be home for a few hours for me to show it to him. Envy - at the fact that MY OWN BATHROOM is too small to accommodate anything like this. Shame - for thinking of my bathroom that way when it boasts such a cool original clawfoot tub. I finally settled in on LOVE. I love today's flip. I love it so much I want to sell my house and get a bigger one so I can have one of these in my own bathroom. 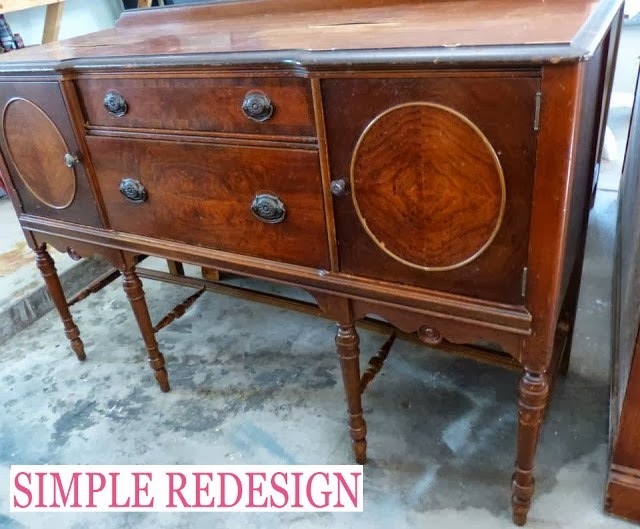 You see, Julie's business Simple Redesign, located in Grand Rapids, Michigan, involves being able to take an old, dated piece of furniture and make it beautiful & modern by using different finishes and techniques. One of her clients had been on the hunt for a smaller sized buffet to transform into a custom vanity for her bathroom. Julie had just the buffet. It needed some modifications along the way but Julie and her handsome handy husband Marc took care of those lickity-split. Nothing was overlooked in this makeover. Julie did a metallic finish on the buffet and used oil rubbed bronze on the hardware. The top was removed because her customer was planning on putting a solid surface on it. Then it was off to her client's house. There I go...back to envy. Isn't that just the coolest thing EVER? You need to go check out the step-by-step of this makeover on the Simple Redesign blog. You can also follow along on the adventures of Julie and Simple Redesign on their Facebook page. Let her know you saw her on Furniture Flippin'. Thanks Julie for sharing your wonderful envy inducing furniture flip! That brings an end to one more week of furniture interventions. We will be doing our wrap up tomorrow and then be back on Monday with a whole new flip! Have you submitted yours yet? Email me at furnitureflippin@yahoo.com . Don't make me remind you again. This is beautiful!! I also like the vanity lights. Where were they purchased? 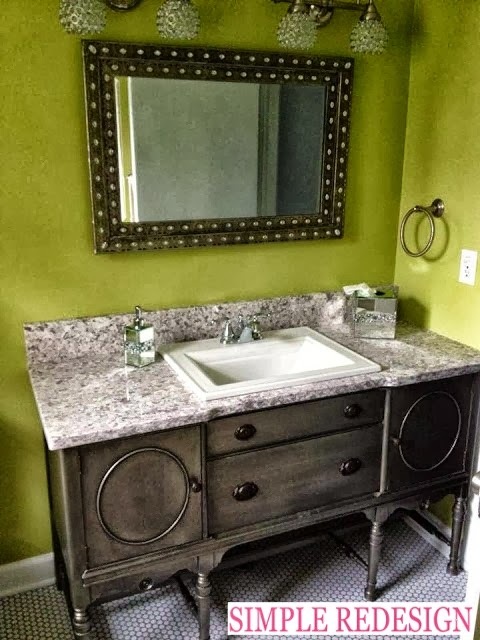 i have a sweet spot for old dressers turned bathroom vanities :) this one is a winner!